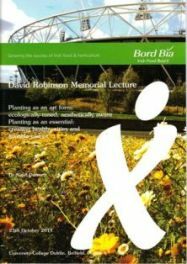 Bord Bia are proud sponsors of the David Robinson Memorial Lecture. This prestigious annual event [launched in 2005] is designed to not only remember the contributions of the late David Robinson, but provides an opportunity for young horticultural students from colleges north and south to come together to learn more about the important contributions horticulture makes to our health, environment and economy. The talk in 2018 was by Darach Lupton on the Oman Botanic Gardens. Darach is the Head of Botany and Conservation Department and Advisor to Living Collections at Oman Botanic Garden. The talk was held at Powerscourt Estate, Enniskerry, Co. Wicklow on the 25th October 2018. The speaker in 2017 was Dr. Tom Young, Research Manager at STRI. Tom arrived at STRI in 2014 with a PhD in Biological Sciences, specialising in the optimisation of green roof substrate for sustainable plant growth and specific service provision. The speaker in 2016 was Richard Barley - Director of Horticulture at Kew Gardens. Richard Barley is a qualified horticulturist and was formerly Chief Executive Officer of Open Gardens Australia. In his previous role as a Director within the Royal Botanic Gardens Melbourne. His topic was on "Horticulture in Botanical Gardens". The 2015 David Robinson Memorial Lecture was given by Nicola Gammon from Shoot Limited about how Shoot (www.shootgardening.co.uk) has created a successful horticulture community online. It was held at University College Dublin on the 22nd of October 2015. Copies of the slides can be found here. The 2014 David Robinson Memorial Lecture was delivered by James Alexander-Sinclair, one of the UK’s renowned garden designers and broadcasters. During his presentation, James described in entertaining and engaging detail the joys and trials of designing gardens for different sites. the talk was given at the Institute of Technology Blanchardstown. More details here. The 2013 David Robinson Memorial Lecture was given by Alan Power, who is the Garden and Estate Manager at National Trust, Stourhead. The lecture focussed on the challenges of maintaining a large heritage garden and was given to a packed hall in the Pillo Hotel in Ashbourne. An inspirational talk by Leigh Morris, President of the Institute of Horticulture (IoH) was given to an enthralled audience in the Botanic Gardens, Glasnevin. See slides here. "The promotion of designed environments that are rich in vegetation and nature is central to my research and practice. This work combines and integrates my background and experience in both horticulture, landscape design and ecology. While ecological ideas in landscape design have often been applied at the larger scale, my focus is generally at the smaller scale: gardens, urban parks, on and around buildings, and in high-density built development. All aspects revolve around exciting and novel uses of plants, innovative planting design, and application of ecological concepts to achieve low-input, dynamic, diverse, colourful and ecologically-tuned designed landscapes." The 2011 David Robinson Memorial Lecture was given by Dr Stefan Buczacki at the College of Agriculture Food & Rural Enterprise, Greenmount Campus in Northern Ireland. Dr Buczacki’s traced the evolution of ‘grow your own’ from the earliest settled civilisations to current allotment growing. Buczacki did not see that is a recent fad but as something that was probably here to stay, especially as the taste, health benefits and satisfaction from growing and eating your own food was also financially affordable as well. 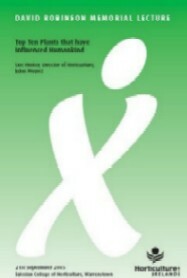 The 2009 David Robinson Memorial Lecture was given by Dr James Hitchmough at Kildalton College Piltdown, Co. Kilkenny. He discussed practical approaches to sustainability (which he used the common definition of "not compromising the needs of the future for the needs of the present") in urban greenspace. He argued that this was not simply about "taking things away and being miserable" but that there were practical actions that can be taken. His three main strategies were to reduce areas of frequently mown grass, adopt new approaches to the management of rainfall and to generate energy and other products from greenspace. 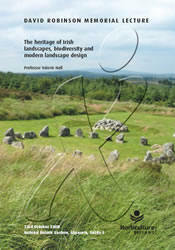 The fourth of the David Robinson Memorial Lectures was given by Professor Valerie Hall on "The heritage of Irish landscapes, biodiversity and modern landscape design". Due to the numbers of people wishing to hear the lecture, it was given twice to packed halls at the National Botanic Gardens, Glasnevin, Dublin 9. Professor Hall gave her views on what are the native species of trees in Ireland and how difficult that is to ascertain. The lecture came about from questions she often received from people wanting to plant native trees in Ireland. In the talk she explained that our indigenous trees (not too dissimilar from our people) originally came from many sources and were often influenced by geographical, meteorological and sociological factors. The third of the David Robinson Memorial Lectures was given by Dusty Gedge of Livingroofs on the subject of "Greening the Urban Jungle, Plants, Soils, Buildings and Climate Change". The lecture took place at the Astra Hall University College Dublin. The event was organised by Bord Bia and the UCD School of Biology and Environmental Science. Plant physiologist, Dr Wheeler delivered the second annual Bord Bia-sponsored David Robinson Memorial Lecture at the Kildalton Agricultural and Horticultural College, Piltown, Co Kilkenny. 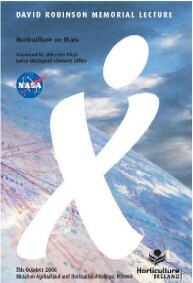 Ray Wheeler is a senior scientist at NASA's Kennedy Space Center in Florida, and currently serves as the lead for plant and crop research for NASA's Advanced Life Support Program. In the lecture, given to about 80 students at Kildalton College, Dr Wheeler talked about NASA’s research on the possibility of producing fresh vegetables and small fruits in space to supplement space travellers’ diets. He talked about Nasa's research into the possibility of producing fresh vegetables and small fruits in space to supplement space travellers' diets. He also discussed studies into how to grow wheat, potatoes, carrots and other vegetables once space travellers set up bases on the moon and Mars. "When humans venture beyond earth orbit and on to Mars, horticulture and plants will surely follow," he believes. "As mission durations increase, so would the role of horticulture, where plants would provide an increasing proportion of food, oxygen, carbon dioxide removal, and water purification. In all cases, innovative horticultural technologies and approaches will be required." "The cosmonauts thought it was very good. They really enjoyed fresh flavours added to their stored foods," Dr Wheeler said. In the first of the David Robinson Memorial Lectures, the director of horticulture at the Eden Project in Cornwall, Sue Minter, revealed her 'top 10' plants that have changed humanity. Speaking at the Salesian College of Horticulture in Drumree, Co Meath, Ms Minter said that both positive and negative impacts influenced her choice of the 10 plants of most importance to mankind. Her top plant was the opium poppy, Papaver somniferum, chosen because it has had the most positive and negative impact on humanity. She said that although opium was vital as pharmaceutical morphine in the treatment of cancer, it also brought 'untold human misery through heroin addiction' .